Meredith M. Dangel – Delighting in the different, the daily, and the divine. Autism (or maybe just parenting?) changes us in the best and sometimes funniest ways. Neither Keith nor I have had a McDonald’s cheeseburger in more years than we can count. Keith knows it’s 20+ for him. I imagine it’s the same for me, since I never liked them anyway. Most people know Henry’s autism traits fall hard on the “restricted interests and behaviors” side of the spectrum. Food is a huge problem. We go to restaurants only a few times a year with the larger family. Eating at home is more enjoyable as well as practical for the 3 of us. Travel presents challenges, as we must carry along with us what we know Henry will eat. I tell you all of this because it’s impossible to capture the shock we felt tonight. Henry said he wanted to try a cheeseburger. From McDonald’s. 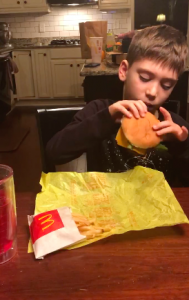 The thought is enough to make me gag, and I’m pretty sure pre-Henry Keith would have bet his 401K that he’d never buy his child a McDonald’s burger, yet tonight Keith went straight to the Golden Arches. It took 1 minute and 20 seconds for Henry to chew his first bite. I felt confident I was about to see him run to the trash can. He ate half of it. I may or may not have teared up later, watching the video. He also tried sushi a couple of months ago. The experiment didn’t take, but he gets points for swallowing it. In fact, he asked for it, out of the blue, much like tonight’s cheeseburger. On December 23, in a burger joint with my family, he asked for a grilled cheese. I didn’t push it on him. I didn’t order it on the sly, whispering to the waiter. He asked for it and ate 3/4 of it. I always say his time, his way. I guess food is just the latest manifestation of this truth. We love family game time. It’s a low-stress and inexpensive way to spend time together for any family, and I am asked often for our favorites. I hope this list will help you find something new to try this Christmas! 1. Ticket to Ride (8-12 years) Adults love this game too! Just know this isn’t a fast game and you need about an hour. 2. Uno / Uno Attack (7+) Everyone knows Uno, but have you tried Uno Attack? 3. Rummikub (8+) Like a card game except on tiles. 5. Hang On Harvey (6+) A silly and fun game that brings out the giggles! I think kids even younger would probably get the hang of it. 6. Sleeping Queens (8+) This game is even fun for kids much younger. We began playing this game when Henry was 5 or 6, and we still play it today! So fun and creative and also a great way to learn basic addition and subtraction. 7. Bugs in the Kitchen (6+) This game is a little pricey, but it’s understandable since it comes with a Hexbug nano. This game is made by Ravensburger, manufacturer of excellent puzzles. 9. Bop-It (8+) Henry loves this game much more than I expected. Think of the old game called Simon, except with fun movement instead of pressing colorful buttons. 10. Gravity Maze (8+) This is a new favorite. There’s also a laser version. And up next… we’re going to try Not Parent Approved, an award-winning card game for kids. Stay tuned! I hear Santa is bringing this. I’ve had an epiphany over something I’ve been struggling to express in words. Inclusion is more than a feeling. We may feel welcoming in our hearts, but if our physical spaces and systems are not inclusive, what we feel doesn’t matter. None of us believe we are prejudiced, racist, ableist, homophobic, or unwelcoming. Society has outliers, of course, but the vast majority of us know these words aren’t positive adjectives. Do our actions and spaces align with our hearts? In our schools, businesses, and places of faith, we must think about what our programs, words, services, and buildings say to those who are atypical or simply different than us. The Americans with Disabilities Act “requires public accommodations to provide goods and services to people with disabilities on an equal basis with the rest of the general public. ” This is why we have elevators and wheelchair ramps, to name only 2 of the more obvious accommodations. We need to take this idea into this 21st century. Disabilities are seen and unseen. Do the spaces you inhabit welcome all? Go on a scavenger hunt in your mind and try to determine how accessible these spaces are. Let me know what you find! This week I had the opportunity to think of the day Henry went to Perry Harrison for his kindergarten assessment. (I’ve written about this before.) Despite visiting the school several times already, when we walked in the front door, his body instantly went into fight-or-flight mode. It was evident to anyone in a 1-mile radius that he was in serious distress. Keith answered, “Say the ABCs.” Like magic, the meltdown simmered and then stopped. Henry loves to learn. This has been a blessing in the most remarkable and unexpected ways, which I could list ad nauseam, and I mean this in the least braggadocious way possible. What I mean is that when we allow a individual’s strengths to shine, disabilities don’t hold the same power over us. They still exist and affect the individual’s life – yes, absolutely. However, the power diminishes. But here’s the catch. it takes patient people to nurture those strengths. Parents, guardians, caregivers, teachers, therapists, friends, doctors… whoever is in the individual’s “village” must be patient, nurturing, and keenly observant. I’m talking eagle-eye observant. We call it the Dream Team, and the Dream Team sees emerging skills, talents, and gifts that may be overlooked by the casual observer or society as a whole. It’s easier to spot a person’s weaknesses, especially a person’s diagnosed “deficits,” but we must not stop there. Be a member of someone’s Dream Team. I encourage you to look for the people in your life, even those on the periphery, who may need to have their strengths encouraged. Then, watch how they sparkle and shine. On Instagram recently, I shared my favorite nonfiction books so far this year. These are not all the titles I’ve read, but they are my favorites in no particular order. All blurbs in quotation marks are found on Amazon, usually written by publishers. “In a time when nearly all institutions (schools, churches, universities, businesses) claim to value ‘diversity’ in their mission statements, I’m Still Here is a powerful account of how and why our actions so often fall short of our words. Austin writes in breathtaking detail about her journey to self-worth and the pitfalls that kill our attempts at racial justice, in stories that bear witness to the complexity of America’s social fabric–from Black Cleveland neighborhoods to private schools in the middle-class suburbs, from prison walls to the boardrooms at majority-white organizations. “Naoki Higashida was only thirteen when he wrote The Reason I Jump, a revelatory account of autism from the inside by a nonverbal Japanese child, which became an international success. “Jonathan Wilson-Hartgrove grew up in the Bible Belt in the American South as a faithful church-going Christian. But he gradually came to realize that the gospel his Christianity proclaimed was not good news for everybody. The same Christianity that sang, “Amazing grace, how sweet the sound” also perpetuated racial injustice and white supremacy in the name of Jesus. His Christianity, he discovered, was the religion of the slaveholder. “In 1957, Melba Pattillo turned sixteen. That was also the year she became a warrior on the front lines of a civil rights firestorm. Following the landmark 1954 Supreme Court ruling, Brown v. Board of Education,Melba was one of nine teenagers chosen to integrate Little Rock’s Central High School. Throughout her harrowing ordeal, Melba was taunted by her schoolmates and their parents, threatened by a lynch mob’s rope, attacked with lighted sticks of dynamite, and injured by acid sprayed in her eyes. But through it all, she acted with dignity and courage, and refused to back down. “Kate Bowler is a professor at Duke Divinity School with a modest Christian upbringing, but she specializes in the study of the prosperity gospel, a creed that sees fortune as a blessing from God and misfortune as a mark of God’s disapproval. At thirty-five, everything in her life seems to point toward ‘blessing.’ She is thriving in her job, married to her high school sweetheart, and loves life with her newborn son. The prospect of her own mortality forces Kate to realize that she has been tacitly subscribing to the prosperity gospel, living with the conviction that she can control the shape of her life with ‘a surge of determination.’ Even as this type of Christianity celebrates the American can-do spirit, it implies that if you ‘can’t do’ and succumb to illness or misfortune, you are a failure. Kate is very sick, and no amount of positive thinking will shrink her tumors. What does it mean to die, she wonders, in a society that insists everything happens for a reason? Kate is stripped of this certainty only to discover that without it, life is hard but beautiful in a way it never has been before. “For Francisco Cantú, the border is in the blood: his mother, a park ranger and daughter of a Mexican immigrant, raised him in the scrublands of the Southwest. Haunted by the landscape of his youth, Cantú joins the Border Patrol. He and his partners are posted to remote regions crisscrossed by drug routes and smuggling corridors, where they learn to track other humans under blistering sun and through frigid nights. They haul in the dead and deliver to detention those they find alive. Cantú tries not to think where the stories go from there. “Tara Westover was seventeen the first time she set foot in a classroom. Born to survivalists in the mountains of Idaho, she prepared for the end of the world by stockpiling home-canned peaches and sleeping with her “head-for-the-hills” bag. In the summer she stewed herbs for her mother, a midwife and healer, and in the winter she salvaged metal in her father’s junkyard. “Are you ready to wake up for your life and not just to your life? Don’t worry; you don’t have to be a morning person to start each new day well. Join Kat Lee and thousands of women from countries around the world who have learned to maximize their mornings. In Hello Mornings, Kat introduces a simple yet powerful three-minute morning routine that integrates Bible study, planning, and fitness into a foundational morning habit that fits into every schedule. She then helps you build each of these core habits for life-long growth. In short, he is totally in his element. He is both happy and at peace. In all my daydreams or even passing thoughts about motherhood, I never imagined this. How could I? I knew nothing about trains or computer games. I knew some boys played sports. I knew some boys played in the woods and came home dirty. I knew some liked to hunt and fish. I knew some did all of the above. I didn’t know 7-year-olds begged for a computer so they could buy a game called Train Simulator. I didn’t know that 8-year-olds could know the difference between a “laggy” computer and a fast computer and would beg for a fast one. That doesn’t mean Henry’s interests are wrong or abnormal. It just means I didn’t know. His story is intertwined with mine, so I’m learning and laughing along with him. If I attempted to force him into my box of expectations, imagine what we all would miss. As I said recently to a group of parents, not only would I stifle the man God created him to be, but selfishly speaking, I’d miss out on so much too. A Henry without trains would mean no joy on his face, no sparkle in his eye. I can’t even bear to think of what this would do to him. I’ve read what it has done to others, and I can’t let my mind go to those dark places. Not with my son. It would also mean Keith and I would remain stuck in our own interests and experiences, never expanding our knowledge of the world. (Did you know the New York subway used to have rattan seats?) Sure, I like my hobbies and such, but learning about Henry’s – and encouraging his passion – has had untold positive benefits on my life. I see other wonderful parents experiencing this same shift of expectation to reality. A sweet friend of mine, a sporty lady, is raising a daughter who loves to dance and just made the competitive dance team. My friend knows nothing about dance but is learning fast. I also see the opposite: Parents forcing their kids to do activities they don’t enjoy or even hate. It’s not my place to judge, and perhaps they have sound reasons, but I don’t understand this. They went on to say that they still love watching and attending football games as a family, but they also love hearing their son’s band play. I think what these parents discovered is that their son enjoyed football, and maybe he was even good at football, but his passion was something else. I wonder sometimes what would have happened to me if my parents had pushed me to something simply because I was good at it. I had the good fortune of not struggling in school. What if they had insisted I attend a different college or major in math simply because they thought it would land me a more profitable job? It would have killed my soul. Give me any spiritual gift or personality inventory and you’ll see working with numbers is not how I’m wired. What if they had forced me to play a sport, no matter how uncoordinated I was, because they enjoyed watching that more than piano recitals? This, too, would have killed my soul. Maybe it’s because my parents gave me the gift of choice or maybe it’s not, but I’ve never felt compelled to force activities on Henry. He can shoot hoops or practice putting with his neighbors and know that we don’t expect him to join a team. He is allowed to enjoy recreation with his friends without pressure. On the other hand, I do expose him to as much of the world’s variety and beauty as I can. We discuss what sports his friends enjoy playing, as well as our local sports teams. (He loves to chant “UNC!” with his friends.) We talk about music lessons and chess teams and painting and running club and Boy Scouts. We appreciate nature and point out the birds we know. We travel across rural landscapes and into cities as much as our circumstances allow. At any moment Henry expresses interests in trying something new, I do all within my means and common sense to make it happen. Henry is well aware that many opportunities exist, but he also knows what he loves. Observing his love develop, deepen, and mature is one of my greatest joys. The creativity of our God is on beautiful display when we appreciate our differences. We do so with conversation and travel and also by enjoying the product of our collective imaginations. The latter we accomplish through fine arts, literature, technology, and architecture, as well as so many other ways . . . even train simulators. … when God begins to do a new thing, old things must pass away. […] in order to experience resurrection we, too, must die. It felt indulgent and ridiculous to suggest I might leave my career, my students I love, and my family’s assurance of health insurance. Yet, as the awkward words hung in the air, I knew they were true. I’ve waited several years for those words to make sense. As Emily P. Freeman says, “Logic and limits often get in the way of longing.” Many legitimate, practical reasons meant I couldn’t quit my job without a clear direction of what to do next. So, I ran to every opportunity instead, even when it didn’t sit right within my spirit. I applied for jobs I didn’t want. I even interviewed for a job I didn’t want. Somewhere along the way I let myself die the little death of seeking understanding and control. I allowed myself to want the Giver more than the gift, knowing in time He would reveal His way to me. This doesn’t mean I didn’t battle frustration or confusion. It does mean I stopped grasping at straws. I stopped praying for clarity and guidance and prayed instead for peace. In the years after Henry’s diagnosis, three things happened inside of me. First, learning about my son’s beautiful mind and my own mental health informed and shaped my teaching. My thoughts became less concerned with innovative group activities and turned instead to the student suffering from anxiety; the one who told me she was sexually assaulted; the one whose dad was murdered in his convenience store; and the ones who need disability accommodations. More and more, I thought of the students’ emotional needs, not their writing. Second, I became a passionate advocate for the rights of individuals with autism and also for the parents of children who have special needs and disabilities. Those parents often need care for their own mental and emotional health, despite the fact they often believe they don’t have the time or money to do so. The unfortunate reality is that the entire family suffers and no one receives the level of care they need if the caregivers don’t prioritize their own well-being. I’m called, emailed, or otherwise messaged on a regular basis by families who have questions or need a listening ear. I’m honored to be a confidante, but I found myself wanting to help even more and not knowing how. I often wondered, is there such a thing as a special-needs-parent life coach? The stirring within me, as you might have guessed, now has more shape. After the years of both running and resting, wondering and waiting, a series of events led Keith and I to the undeniable conclusion: I need to go to school. The end of ourselves is the beginning of Him, and the wandering and waiting that once made us feel lost can now prepare us for more. Fear, worry, and tension wash away as we’re no longer defined by our circumstances but instead are vertically aligned with the purposes of heaven. I did. And a few months later, to my great surprise and delight, I was accepted. In August I will start work on my MS in Clinical Rehabilitation and Mental Health Counseling at UNC. What will I do? The real answer is that I don’t know what God has in store, but I can tell you my dream. I dream of counseling people with autism and other disabilities, as well as their loved ones. These unexpected issues bring both extraordinary beauty and unique challenges to family dynamics and other close relationships. I want to support the mental health of the entire family. Our family has found this is a gap in the counseling field, and it is one I want to help fill. I believe the same passion for people that drove my teaching will drive my next career as well. My calling, to glorify God by serving others, hasn’t changed. My assignment has changed. I am still in awe over the way God prepared me for this assignment all along, from childhood until now, and the way He led me to it. I give thanks for His sovereignty, goodness, and mercy and look forward to what is to come. Good-bye, Tompkins Hall at NCSU. 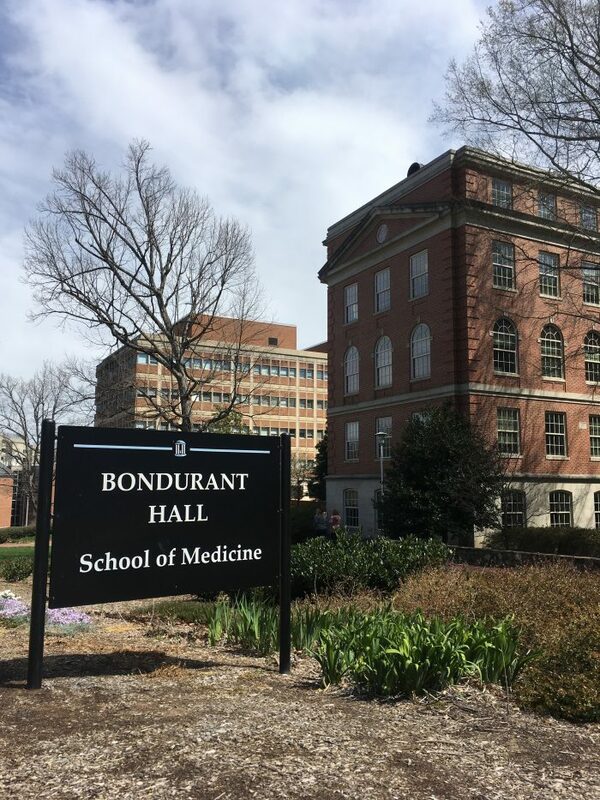 Hello, Bondurant Hall at UNC! Sometimes we laugh until our sides hurt. Sometimes we’re mostly quiet and tired. Sometimes the kids hug and giggle. Sometimes they stomp to their respective homes and slam the doors. Is it mandated? Is it strict? Of course not. But you can find us out there more often than not. It has become our unspoken ritual, this thing we look forward to all day. For a little while, the demands of adulting fall away and we enjoy one another and simple pleasures. My friend’s family eats breakfast at the same place every Saturday morning. The staff know their orders. An acquaintance says her family eats popcorn and rents a movie every Friday night. My Papa loved to sit on the porch to watch the rain. My sister’s family enjoys a golf cart ride in the evening. I make chocolate chip cookies when it snows. Every night Keith gives Henry a special kiss before leaving his bedroom. Our family rituals are a mix of daily, weekly, and seasonal. I bet yours are too. Rituals don’t have to be frequent, though some are, and every good thing that happens doesn’t have to become one. The key is not to force it, but to honor it when it occurs. Our children may count on them without us – or them – even realizing it. For instance, last year Keith and I decided to cancel our traditional Memorial Day cookout, when Henry voiced his sincere displeasure with that idea! On with the party. We didn’t know how much it had meant to him. Now that we do, we’ll maintain the tradition as long as it is still working, still providing that pleasure for all who attend. What small moments are we both creating intentionally and allowing to happen for our children? Maybe it’s not a luxury. 10 minutes alone in the bathroom? A mom on social media smugly remarked that her daughter had never used an ipad or iphone. Well, good for you, rang in my head. See, an ipad might seem like a ridiculous toddler indulgence to her, and I agree it still can be (for sure), but the absence of an ipad is luxury to me. I don’t know if I’ll ever forget the looks of shock Keith and I exchanged in our early days with the ipad. Just for fun, Keith bought one app and showed it to Henry. The next thing we knew, Henry was interacting with books and his fingers were flying through Memory games, the very same games he ignored unplugged. As he sped through the levels, we simply gaped. There was no turning back. Matching games, animals sound games, alphabet games, number games, drawing games, train-building games. You name it, he loved it. And then there was the day I said, “Holy cow, is he… spelling?” Our little guy, who could barely put a sentence together with his mouth, was using the ipad and his fingers to spell. As we were learning the value of pictures for the autistic brain, we were also struggling with bedtime. Keith created a simple visual schedule on the ipad with four pictures of Henry’s bathtub, toothbrush, books, and bed. That evening Keith showed Henry the pictures and clearly, firmly declared, “Bath. Brush. Books. Bed.” Bam. Henry was going up the stairs without complaint. We stared at each other. Could it really be that easy? We’ve read and watched the beautiful stories of nonverbal folks who now speak with an ipad, unlocking what has been tucked within, in some cases, for many years. We’ve cried along with the parents who discovered their children’s personalities for the first time. For us the need for the ipad is not quite that dramatic. But here’s what it does for us: We no longer have to be terrified of dining out with friends and family. We eat out very infrequently, turning down most invitations and choosing to cook at home or have take-out when it’s just the three of us. But, when we must, we don’t carry fear with us. We can pull out the ipad if the wait becomes too long and/or Henry’s sensory needs are exploding. Many aspects of the device are a luxury. He doesn’t need to watch YouTube videos of the dude in New Zealand doing Thomas reviews. On the other hand, the ipad is an absolute necessity. Denying access to his ipad after 30 minutes waiting on food in a restaurant would be like taking away another kid’s crayons. I didn’t plan this. In fact, I planned the opposite. I bought the handmade crayon roll, ready to whip out of the bag at a moment’s notice. I had the purse-sized coloring and activity books. I tucked the tiny Toy Story figures into his diaper bag so he could act out stories. Yes, I was the typical mom. But I don’t have a typical kid, so I had to stop being a typical mom. My son would rather be ninja-kicked in the jaw than forced to color. And playing with little figures? Um, no. Autism changed my definition of luxury, just as it changed everything else. And I do mean everything. An expensive piece of technology for a 3-year-old? No. My little guy spontaneously pulling out an activity other than trains or the ipad? Please believe me when I say that technology addiction is a real challenge, but this truth does not negate the other truth: we would never enter a restaurant without it. I want to help the judgers. I want to provide just the smallest glimpse into our lives so others can acquire understanding and empathy. How can they know if we don’t tell them? Judging is never acceptable, but I do understand how it happens; we’re all tempted to do it. So, the next time you see a child with a device in public and start to blame the parents, just pause. Consider the fact that maybe there’s a reason. Maybe this is one of five times a year the family is served a meal in a restaurant. Maybe it’s not. Maybe the kid is a brat. But will your judgement change that? Allow the pause to change you. Doesn’t empathy feel good?